Hi everyone! It’s Laura again from Inspiration for Moms. Today is a beautiful day in Colorado. The sun is out, the windows are open and the birds are chirping. So I though it would be the perfect time to make a Spring wreath for my front door. First you will need your choice of burlap and a floral wire wreath. I was going to pick a green color but my son suggested the teal blue. 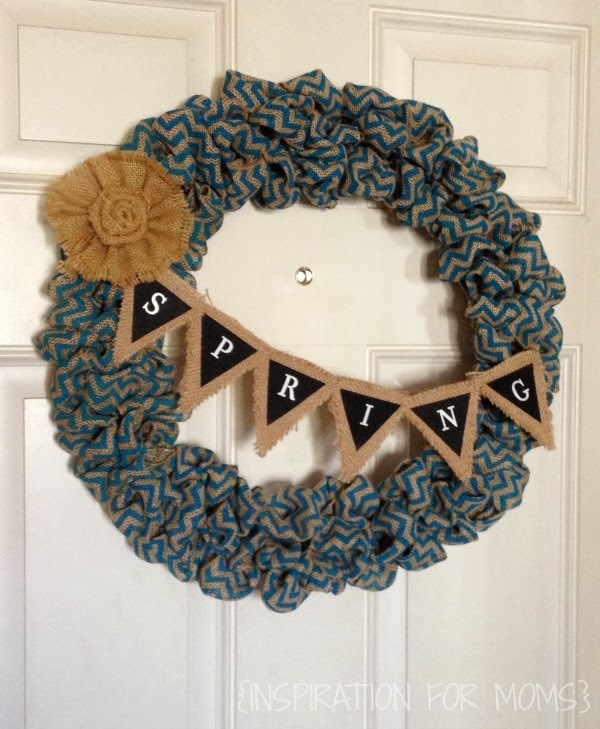 If you are intimated by those fancy looking burlap wreaths, don’t be! I’m hear to tell you there as easy as a simple tuck and fluff! The first step is to tie your burlap around a middle cross wire. from behind the wreath and push it through the wire spacing to make a loop shape. Work your way through all three rows. Now it’s time for step number three, fluff those loops. Once you have fluffed, continue on until you get to the next middle wire. to make the burlap really secure which is step number four. Continue your way around the wreath until completely covered. Now it’s time to make the Spring banner. I already had six burlap triangles but these can be found at most craft stores. I wanted to add some chalkboard triangles for a little contrast. I took some chalkboard tags from a previous craft project and cut them into triangles. I then hot glued my chalkboard cut outs onto the burlap triangles. the banner together on some twine. it would be a perfect accessory for this wreath. Now that my door is ready for Spring maybe the weather will cooperate too. Hey there is only 9 more days until it’s officially Spring. Then it has to get warmer, right?! Thanks for hanging out with me today and I can’t wait to see you again next month! or stop by Facebook, Pinterest or Instagram. Want more? Check out 50+ Burlap Crafts and Decor Ideas!